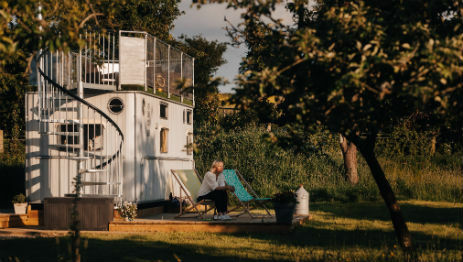 The Glamping Orchard, and as seen on George Clarkes Amazing Spaces, is surrounded by The Cotswolds is ideally located in the heart of the picturesque Severn Vale. 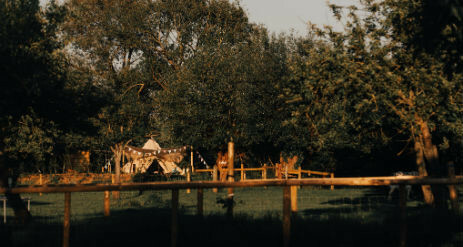 The Glamping Orchard gets you back to nature but not back to basics. Longney is just five miles from historic Gloucester and a lovely short walk from the River Severn. 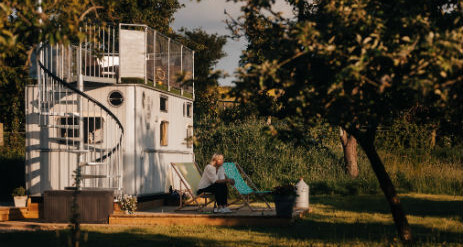 Combining the idyllic peace and quiet of gorgeous orchards and beautiful countryside with close proximity to great pubs, market towns and delightful villages, The Glamping Orchard is set on a family-run smallholding surrounded by farm animals and acres of space. 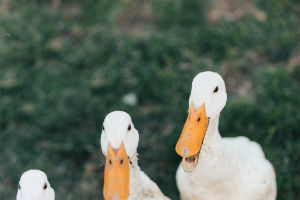 Perfect for couples and families alike, you can collect fresh eggs for your breakfast, experience a memorable horse and cart ride to the local pub or simply go for a long walk foraging for berries down the country lanes. Then what better way to end the day than toasting marshmallows by the open fire and enjoying a glass of wine as you watch the sun gently set across the rolling hills of the Forest of Dean. 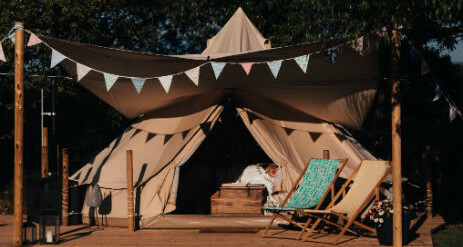 The Glamping Orchard takes the hassle out of camping and offers you ‘Glamorous Camping’ a stress free way to get close to nature, without having to pack your car with camping paraphernalia, put a tent up and then take it down in the rain. Instead start your stay as you mean to go on, relaxed and hassle free. 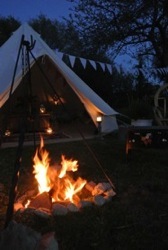 Sleep under canvas, cook under the stars, chill out completely! 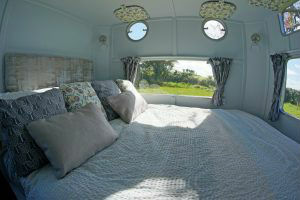 Our magnificent caravan from the 1950’s has been lovingly restored by combing quality and luxury and an added bit of Wow! Meet our handsome Knight and you won’t want to leave. Whether you’re enjoying a sunny day on the iconic roof garden, or a cosy drink warmed by the wood burner, you’ll be hooked. By day, the Warwick Knight has plenty of living space and by night it transforms into the cosy blanket to keep you warm. The interior design, lovingly hand-crafted is fully equipped from integrated stereo to ingenious storage spaces, you’ll never cease discovering the surprises it conceals. A fire pit is outside of the caravan which doubles up as a BBQ and BBQing tools are provided. An initial stock of firewood is provided and more is available from our honesty hut. 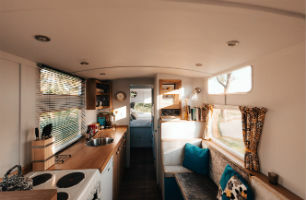 Your private wood fired shower and sink cabin on wheels is just 25 meters away and your private compost loo (child seat can be provided) is adjacent to the caravan. An electric hairdryer is available inside the caravan. When you arrive and park your car Warwick Knight is sited 85 meters up in the orchard. The ground is flat with no steps. There is a step in to the caravan and also steps are leading to the private bathroom. To access the roof garden is by spiral staircase, please take care with young children and anyone who is less mobile as they may find them tricky. If you have friends and family who would like to join you, book Warwick Knight and Belle together and you can bring up to 9 of you together. 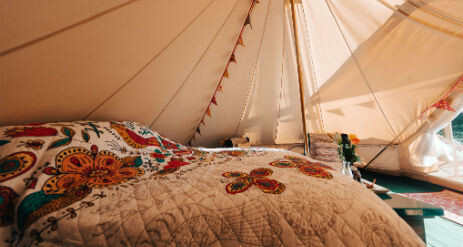 Immerse yourself in your cosy Bell Tent. Sleeping under cotton canvas is a revitalising experience. 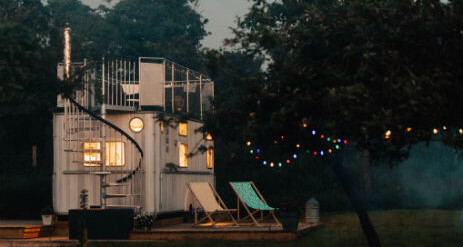 Measuring 3 metres in height and 5 meters diameter they are no means small, offering a perfect space for a couples retreat or a plentiful space for a family or group of 5. All you need to do is pop in sleeping bags for the kids! The large area outside has table and chairs which is covered by an awning, creating a shelter from the elements. 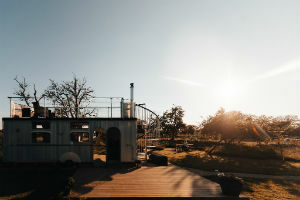 Your private space within the orchard has a fire pit which doubles up as a BBQ and BBQing tools are provided. Charcoal and marshmallows are available from the honesty hut and BBQ basket filled with local and home reared produce can be pre-ordered. 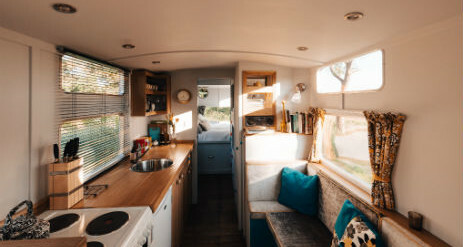 Your private kitchen hut is fully equipped and comes with a double burner gas stove and grill, cooking utensils, pots, pans, crockery, cutlery, cling film, foil, kitchen roll, bin bags, tea towels and washing up essentials. The Washing up sink with running water is close to your tent. Essential condiments: coffee, tea, sugar, oil, salt and pepper, along with cool box with ice packs that you can replenish from our freezer at any time. 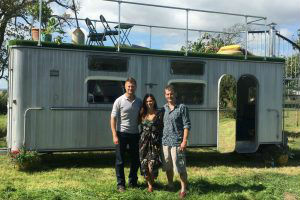 Adjacent to your tent is a rustic bathroom on wheels and comprises of a wood fired shower and sink and separate compost toilet. 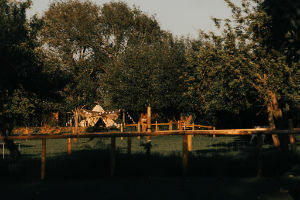 The Glamping Orchard is surrounded by beautiful countryside, quiet lanes and excellent pubs and what better way to explore on a summers evening by a peaceful drive on a horse and cart. Upon request we can organise drives out and even incorporate a picnic or pub stop. So if it is a special occasion, birthday, anniversary, engagement or you simply want a lovely memorable experience, please let us know. A great experience for kids too! 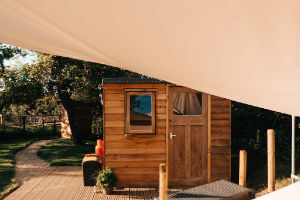 For a stay booked in April 2019, you will receive a complimentary bottle of fizz and locally sourced DIY breakfast hamper which includes, bacon, sausage, black pudding, tomato, mushrooms and fresh eggs upon arrival. Kids also stay for free!